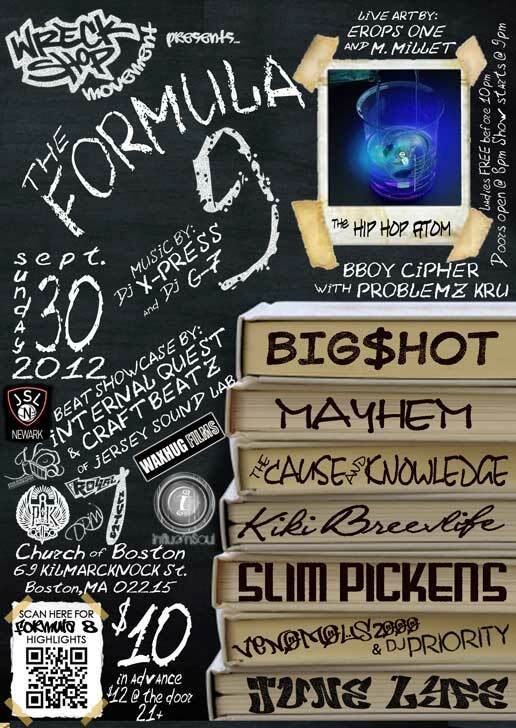 On Sunday, Sept 30th, 2012 Wreck Shop Movement and InfluenSoul Clothing are bringing you The Formula 9 at Church of Boston (69 Kilmarknock St) from 8pm until 2am. DJ Xpress and DJ G7 will be opening up the night before Internal Quest and Craft Beatz of Jersey Sound Lab showcase beats at 9:30pm. Live performances by Kiki Breev Life, Big$hot, Slim Pickens, June Lyfe and also special guests coming from New Jersey Venomous2000, DJ Priority as well as The Cause and Knowledge and Mayhem from Rhode Island. This month b-boys from Problemz Kru will be setting off the live performances at 10pm and EropsOne and Mark Millet are this months featured artists so be sure to check our their work as well. Video: The High Life "El Mariachi"
Video: Mega Trife & Nonsense "Close To You"
Lil Lexy "Pretty and You Know It"
MP3 Single: Greatness "Inside Out"
MP3 Single: Paranom "Out My Mind"
Video: Jus Clide "Dollars and Sense"
MP3 Single: TJ Hickey "Tell 'Em"
Ruste Juxx & The Arcitype "The Walking Dead"